1878 miles. 16 days. Louisiana. Mississippi. Tennessee. Arkansas. Missouri. Illinois. Indiana. Ohio. Michigan. Indiana. Illinois. Some trip. So here are some thoughts as a postscript after the trip. Firstly, the blues: it was great in Chicago to witness a vibrant music scene for this music, long may it continue; Memphis too in part although it’s clear the Beale Street scene has a definite tourist slant; I’d love to have spent more time in Clarksdale, that place is certainly on the horizon for a return trip; the jury’s out on St Louis for me, partly through circumstance with the Cards game affecting what was available musically but BB’s was OK. As I said before, let’s just hope that a new generation is continuing to keep the blues alive. And I still cannot get over or understand how badly the history of the blues is represented in Chicago – I mean, there’s nothing (apart from Chess or, as I also mentioned, if there is stuff in the city they’ve made it impossible to find it even in the internet age). Not unexpectedly, although The Blues Highway book was an invaluable source of reference in planning the trip and whilst I was in the US, it’s very out of date, being over 12 years old at the time of my trip. Despite that, if you’re thinking of doing the Blues Highway it’s worth seeking out a copy if you can get one – it’s out of print – because there’s lots of useful background information. And whilst in many places I didn’t follow the route the author took, it will help you decide what you want to do and see, given whatever time and/or money constraints you may or may not have. I used it to make judgement calls in advance on where to go and what to see. Some of my decisions were right, some were maybe wrong, but available time was the big constraint. The book however was still pretty accurate in respect of highway and Interstate routes. Whilst I got some excellent deals and places to stay I had a couple of blow-outs I suppose regarding hotels. Never having been to the region before I did my research as best I could, and the internet is of course a great help these days, but I can’t recall all of the reasons why I chose some hotels over another. But as mentioned before, both Hotwire and Priceline made those decisions for me when I took pot luck with a blind purchase for a cheap deal (and all the deals are a lot cheaper than rack rates – you pay your money and take a chance). As per my St Louis experience, analysing the selection zones for a town or city is critical. The Pear Tree in St Louis was a disappointment from a location standpoint, as was Indianapolis, but there wasn’t much I could do about the latter. My guess is that as soon as the NFL schedule came out the teams and regular fans would have booked up all the downtown hotels. I would never pay full price for the Peabody in Memphis. Despite my gripes about the room in the Felix in Chicago, from a location standpoint it could not have been better: I decided on the Magnificent Mile River North Hotwire zone and definitely struck lucky there as other hotels could have been half a dozen blocks away or more from where I was (not a huge distance to be sure, but it was good to be so close to Blue Chicago). One other factor in working out the itinerary was that certain events did or didn’t happen on specific days: I’ve mentioned the Chuck Berry thing but, for instance, Tad’s Juke Joint club tour in Memphis normally only runs on Friday and Saturday; the Motown and Stax museums are closed on Monday and the Civil Rights Museum on Tuesday; most NFL games are on Sunday; I could only see Al Green on a Sunday; and so on. This affected when I had to be in Memphis mainly, which is why I couldn’t spend longer in the Delta when I would have liked to have done. Another issue I read about in the guide book is that a lot of clubs and juke joints only open on Friday through Sunday (I think Red’s might do that) which would obviously affect when one could visit. A common theme of my interactions with almost all the white people I came across on the trip was an apparent indifference and lack of awareness regarding the cultural heritage of The Blues Highway. Now I’ve not been everywhere there is to go in the UK but I have visited quite a lot of historical landmarks and locations around the place, and if I’ve not visited somewhere I’m usually reasonably aware of some local cultural history. My point here is that it was the people who were relatively near to the Highway who didn’t seem to know much about it or the places of interest on it, never mind actually visiting them. No-one I met had seen a Delta Bluesman live. Or even been into the Delta, everyone just bypasses it on the Interstate on their way to New Orleans. On a similar note, as I was checking out of the hotel in Detroit, the young white lady receptionist asked me what I doing that day, so I told her I was visiting the Motown Museum – “Oh, I’ve never been, I hear it’s really good”, she said. So, I thought, why haven’t you visited one of the greatest historical music sites in the world when it’s only a short distance away in what I presume is your home town? To a man or woman, all of the African American people I met were more than welcoming (not that white folks weren’t, it just that all of the blacks were more so), from Sylvester and his wife down in the Delta, the cool dudes outside Red’s, Big Dom and the birthday party, the staff inside Stax and Motown, Lorenzo and the crew at Blue Chicago – the list goes on and on. And they all seemed genuinely pleased I was travelling The Blues Highway, whereas the white attitude was a more laissez-faire “Oh, that’s interesting”, which I sometimes thought was said out of politeness rather than genuine interest. At times it almost felt as if some white folks were in denial by not wanting to even learn about the significant black cultural heritage of the region, much less wanting to experience it or integrate with it. Maybe some of the old attitudes are still there underneath it all. I hope not. 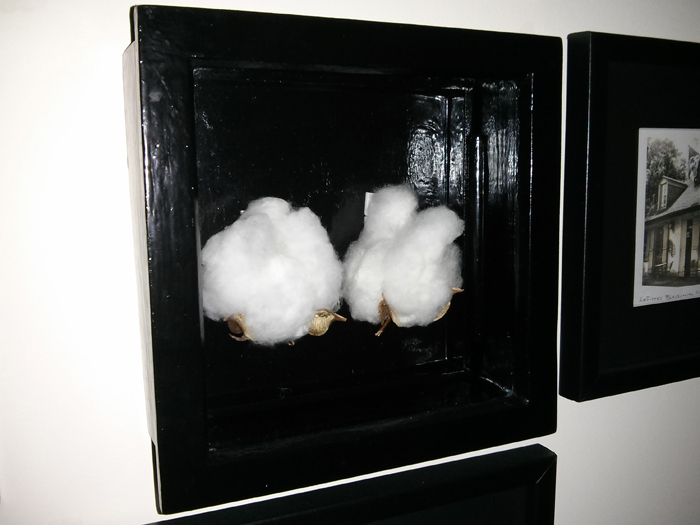 And yes, I got the cotton blooms home safely.